Laini Taylor is quite popular in YA literature right now, with her Daughter of Smoke and Bone series rising in popularity in the genre at the moment - so with the arrival of Lips Touch in my mailbox, I was super excited to get to read the powerful storytelling of Laini's. The book opens with the addictive Goblin Fruit, a story about a girl named Kizzy. Her family is quite unordinary and she is as well. But the most attention-grabbing sentences are the opener, ones that tell of the kind of girls Goblin's like, how they used to rope them in with tempting fruits in past times. But in the modern times, there is a sharp turn on the story and Kizzy is almost blindsided with what extents the Goblins would go to tempt her. 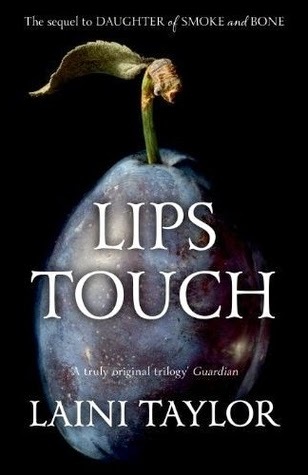 Of all the stories in Lips Touch, Kizzy's is my favourite. The way each scene is crafted so bewitchingly just stole all my attention. Then, in Spicy Little Curses, we meet the ambassador to hell and a demon, and their tale of a curse cast upon a young English girl in India. Her voice is cursed, and knowing that her voice spoken aloud would be disastrous for many, she keeps her lips sealed. But then she falls in love, and it changes everything she knew and cared for. Suddenly, she's thinking about talking, about singing...she's thinking maybe the curse isn't true. Spicy Little Curses is gracefully written and the most creative of the stories. And finally, in Hatchling, just before Esme's fourteenth birthday, one of her brown eyes turns to blue. But it's far more perplex than she could ever have thought. Everything she knows is on the line when her past suddenly comes into light, the howling creeping up on her, enchantingly setting the scene for her destiny to be revealed. Hatchling was charming and ingenious, the most page-turning of the three. I was turning pages fast, dying to find out the end, forgetting the real world. Overall, Lips Touch was what storytelling is all about. Laini Taylor has captured every dark, lips touching, fate and destiny awaking, fairy tale and sealed it up in a magical, visionary novel. The illustrations that map out the story before we read are beautiful and elegantly drawn that they held my attention like the very words on a page. It was imaginative, passionate and by far one of the best books I've read this year. 5 stars completely. Goblin Fruit! Everything Goblin Fruit. YA Fans everywhere. Have you read Lips Touch? Tell me in the comments, on twitter or by using the hashtag #LipsTouch happy reading!